Here's my proposal. At present, the US military budget is more than 1/3 of the world's total, more than the next ten countries combined. That doesn't include the black budget, hidden from Congress and from the American people, which according to this Michigan State Univ study is three times larger than the official accounting on which the chart below is based. 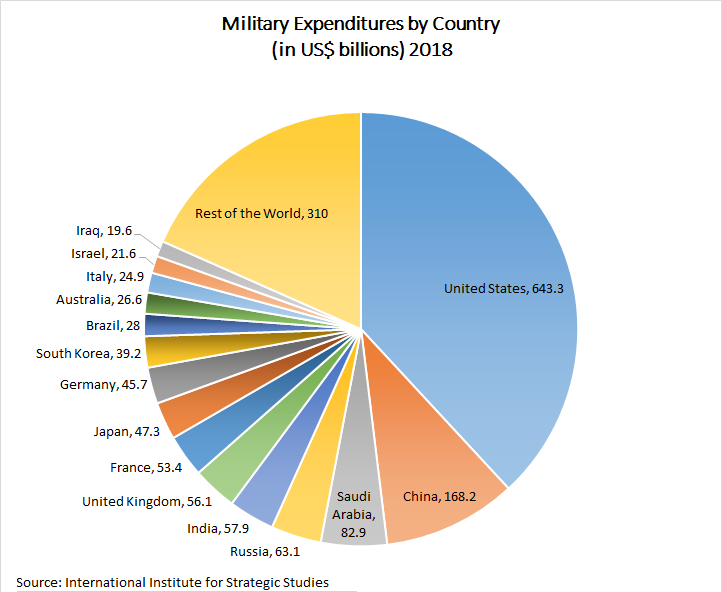 We should then announce that we will limit our future military spending in the same manner, never to exceed the next two rivals* combined, so that as other countries reduce their military, the US will follow them in disarmament. *Saudi Arabia is a special case. Historically, they have been the largest supplier of crude oil to the US, and in order to avoid a lopsided balance of payments, the House of Saud royal family has purchased far more American hi-tech weapons than any other country.